Owls have developed these features to aid them in catching quick rodents. Three-dimensional vision is what we as humans possess. This similarity lies in frontal eye placement and allows for dual focusing. Unlike man, an owl's ears are also facing forward; they are purposefully askew. Hearing a sound from two perspectives simultaneously allows an owl to make a direct catch in the dark of night [source]. The owl's brain actually calculates the minute time difference between sound reaching one ear and then the other in order to pinpoint prey precisely. One ear is above the ocular cavity and the other is below. These openings are quite large for an animal of this size. 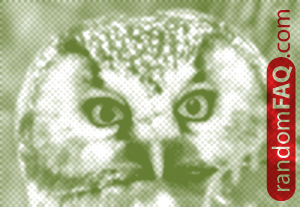 Amazingly, using hearing alone the owl can map out its surroundings in a subconscious sound simulation. In pitch black, an owl can know both the general size of its victim and the direction in which it is running in [source].